Trailhead is at the end of Kearsarge Mountain road in Wilmot, NH. Take Exit 10 off Rt. 89 in Warner and turn right onto North Road. Quickly turn right to stay on North Road. In 0.4 miles, turn left onto Kearsarge Valley Road. Drive 3.0 miles, then turn right onto Kearsarge Mountain Road. Go 1.6 miles up this road, then turn right into the Winslow State Park Entrance/Kearsarge Mountain Road. The parking area is 0.9 miles up this road. Mt. Kearsarge, one of the most popular hiking destinations in southern NH, has expansive, panoramic views from its wide summit. This hike begins at Winslow State Park. Walk to the "To All Trails" sign and fork right onto Winslow Trail. The trail crosses a power line clearing, then climbs moderately through the woods. Eventually, the trail steepens and becomes much rougher, quickly climbing to a rock painted with a "1/2" at 0.6 miles. After a rough section, it levels off and reaches the first open ledge, with a directional view to the west. Soon, the trail emerges on open rock and winds through small fir trees. Barlow Trail joins from the left just before reaching the top. On a clear day, you can see the White Mountains to the north. In front of the Whites is Ragged Mountain, and to the left are Mt. Cardigan and Smarts Mountain, among others. To the west, you have a good perspective of the lengthy ridgeline of the Green Mountains. To the southwest is Mt. Sunapee and Lake Sunapee. Mt. Monadnock can be spotted in the distance to the south, as can the Wapack Range. To the southeast, the small Uncanoonuc Mountains rise from the flat expanse. At the highest point is the summit fire tower, while in a sheltered area are a few picnic tables. There is plenty of space to move around on top, which is advantageous, since heavy crowds are common. After enjoying the view, you can return on the more gradual Barlow Trail. 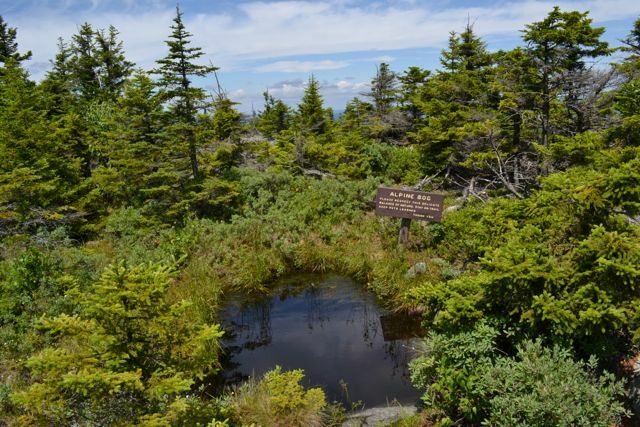 The Barlow Trail winds through the fir forest on the open rock for about 0.3 miles, passing an alpine bog near the end. Hikers will find excellent viewpoints along the trail where it's much less crowded. After the trail leaves the open ledges, it meanders through the forest for the remaining 1.3 miles, descending at a mostly moderate grade. A sharp left turn marks the halfway point in this section.